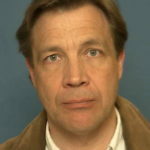 Since 2012 Lars Gustaf Andersson has been professor in Comparative Literature and Film Studies at Lund University, Sweden. He has worked primarily with cinema cultures including experimental filmmaking. He is also a supervisor and teacher at the Lund University School of Creative Writing. Since the 1980s Andersson has published seven collections of poetry. A new volume is forthcoming in 2018. In essays and reviews he has introduced American poetry from Robert Lowell to Claudia Rankine to Swedish audiences and he reviews new poetry in the Swedish literary journal Lyrikvännen.